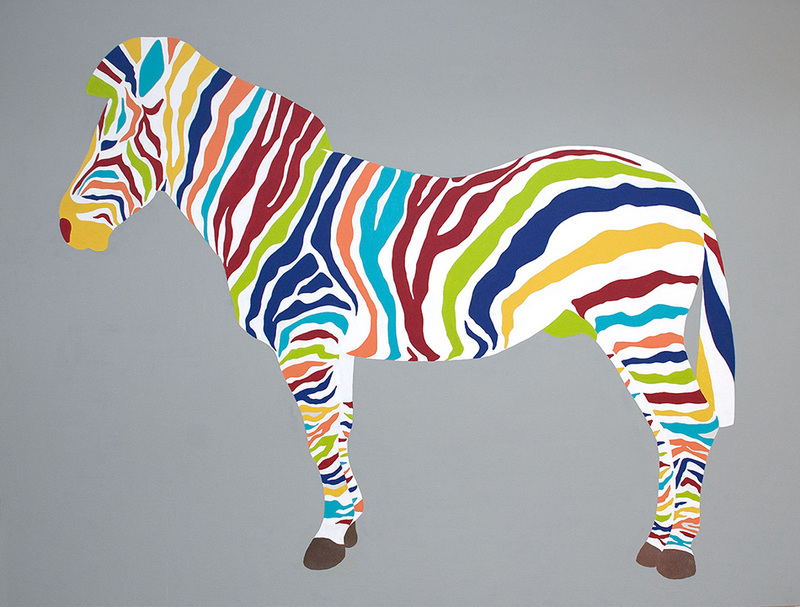 “Of course what I really want to paint is a life size zebra…” Clients with vision and a high ceiling took me up on this. The eaves in my attic studio proved challenging but an exciting opportunity in 2009. The client wanted to commission a work for a wide, high ceiling wall in their home. Having visited the space my suggestion of a triptych, which would cover enough wall space to make a bold statement was agreed. They then visited my studio to see my work close up to discuss ideas, the part I enjoy the most. My studio is cluttered with various objects collected at random that catch my eye. Sometimes they immediately inspire a work, othertimes they gather a thick layer of dust before I see them in a new light. The client admired a slightly mouldy rubber bath toy in the shape of a rather beautiful, realistic Koi carp. 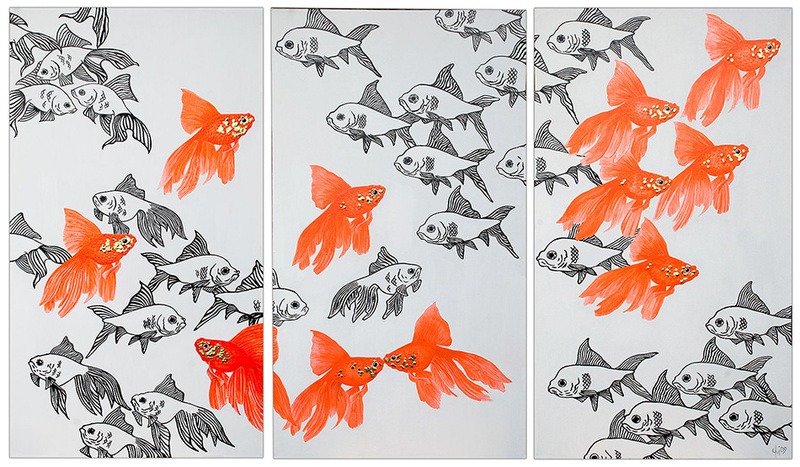 This became Goldfish Triptych. 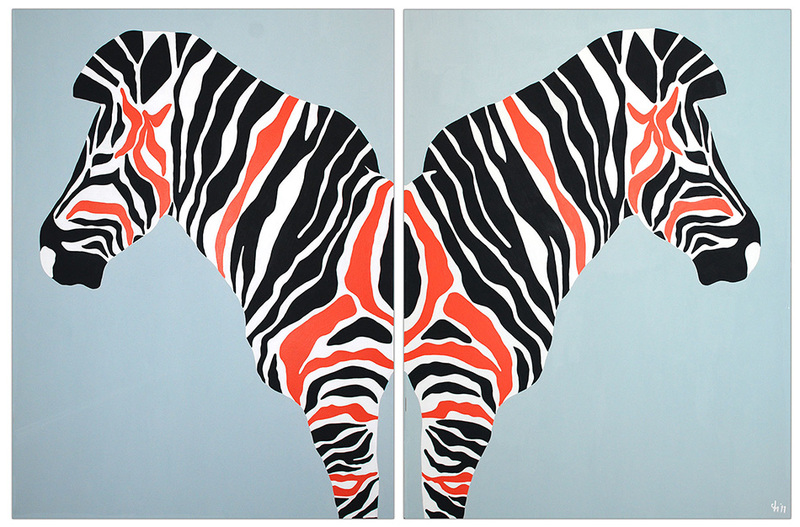 The client loved zebra diptych but couldn’t decide whether to commission a new version or a smaller version of the more colourful life size zebra. I suggested I visit their home to get a better sense of their environment. A huge bowl of oranges, pride of place on the kitchen table, inspired me to add a series of symmetrical orange stripes to the originally monochrome zebra diptych design, creating an additional abstract pattern within the stripes.